You're sure to find a cup of tea, a biscuit and a friendly chat at our Newbury Show Centre. 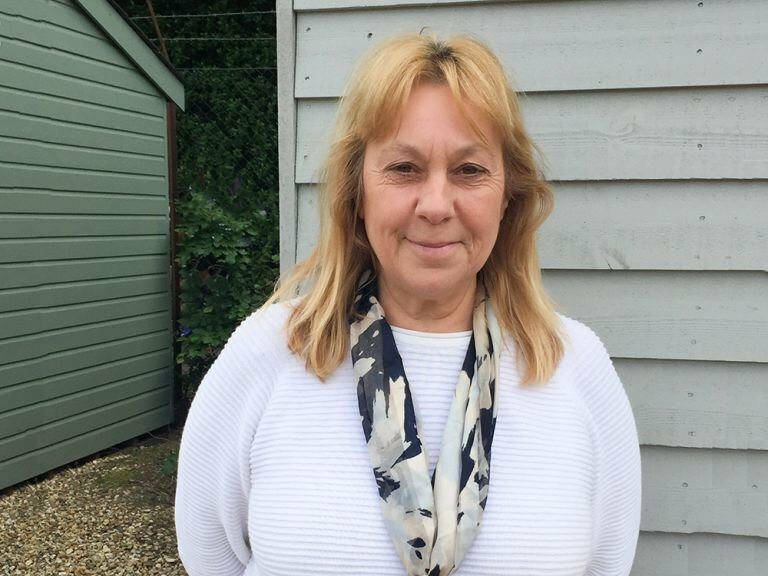 Paul is the sales manager here, and Pauline is also sure to offer a helping hand when needed. Whether you think you need a site visit, advice on planning, or just a bit more information on our buildings, our helpful team will be willing to offer guidance and share their knowledge with you. There is a wealth of knowledge behind these two, and you're sure to be in capable hands when speaking to them about your building requirements. 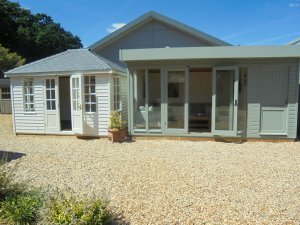 Crane Garden Buildings at Newbury is located in beautiful West Berkshire, just off the M4. 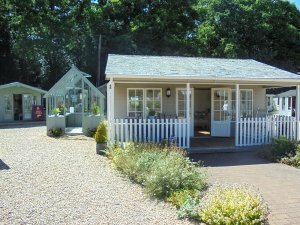 We have our full range of buildings on display, including Garden Sheds, Summerhouses, Workshops, Garden Rooms, Garden Offices and Studios, Timber Garages and Greenhouses. We always strongly advise any potential customers to view our buildings, to see the quality of the timber, the build and finish. 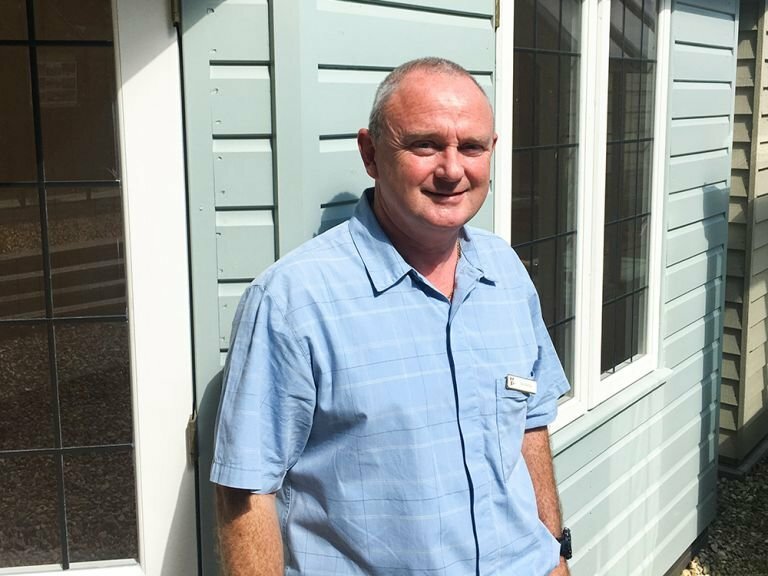 Our dedicated and friendly team will be able to work closely with you to arrive at your ideal design and building, including discussing any base work, electrics and planning drawings that may be required. We are located on site with Hillier Garden Centre, which has a large range of plants, as well as furniture, a garden tools section, and they have recently opened their wonderful restaurant, Mulberry & Thyme, which offers a lovely selection of sandwiches, cakes and hot meals. Come and see our large range of garden sheds and buildings for yourself. Based just 1 mile from Junction 13 of the M4, we are only round the corner from the North Wessex Downs if you want to make a day of your journey as well. We are open 7 days a week, and our opening times can be seen further down this page. Based just 1 mile from junction 13 of the M4. Recently made to order and handcrafted at our Norfolk factory using only the finest FSC® certified timber, this charming corner summerhouse was ordered by a customer wanting to make the most of their outdoor space. 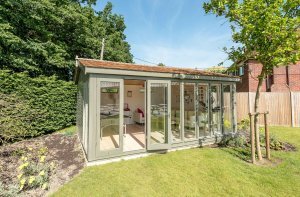 Nestling nicely into the corner of any garden and therefore utilising all available space, the Weybourne Summerhouse is an ideal choice for those working with trickier plots or limited space. 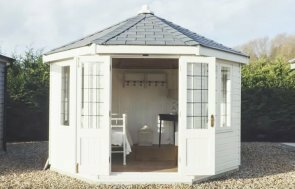 As with all of our high-quality timber buildings, the summerhouse was both delivered and installed by our in-house fitting team.